“Most of the time, things seen on mammos and ultrasounds are not bad,” Laurie Gaughan said. But in her case, being an ultrasonographer at PinnacleHealth, she had more expertise than most of us when viewing her diagnostic results and, therefore, when she saw her ultrasound images on the monitor, she was almost certain that she had breast cancer. This married mother of three teenage daughters considers herself very knowledgeable about the importance of maintaining good breast health and early detection, but she never felt any lumps or had any symptoms. She recalls that even after viewing her own images and drawing the likely conclusion, the staff still had to go through the proper procedures to prove and then inform her of the diagnosis, which was difficult for her caregivers and also for her. She received the confirmation call on April Fool’s Day in 1998. Gaughan praises the way her surgeon handled her case, being willing to spend as much time as was needed to explain things and to present her options. In her line of work, she said that she’s seen women suffer great emotional distress caused by those exact anxieties, and it turned out to be the right decision because there was some lobular cancer in her other breast. She also praises her husband for supporting her decision. Although she was in a great deal of pain after the surgery, as soon as she was permitted to do so, Gaughan started swimming and moving her muscles as much as possible. Gaughan feels that the thing she struggled with most during her recovery was the medications she needed to take. She had no energy and was in a lot of pain, making it difficult to do much of anything. When she was diagnosed with breast cancer, Gaughan said she didn’t feel the need to join a support group, but felt that her husband Brian would have benefitted from one. The problem was that they couldn’t find one that welcomed men. 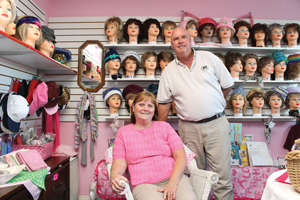 That store, named Pink Hands of Hope, is a nonprofit thrift store relying on donations, both monetary and those of quality furniture and clothing. In addition to the thrift store, PHOH has several other programs geared toward helping those who are touched by breast cancer to cope. One of those, the “adopt a patient” program, helps patients who may be struggling to pay their bills by using both donated funds and profits from the thrift store. As she celebrates her continued cancer-free status, Gaughan knows that feeling good about yourself and having a positive attitude is a big part of a successful recovery. It’s also OK to admit that there are times when she experiences an ache or pain that lasts for a while and the thought of the cancer returning pops into her head. If you would like to donate money or clothing or you would like to volunteer at Pink Hands of Hope, please visit www.pinkhandsofhope.org.